DragonPlate lightweight modular tube connectors provide an easy and robust method for connecting our round carbon fiber tubes together to form complex rigid structures. Using the large selection of our patent-pending anodized aluminum connectors, our 0.5", 0.75" or 1" carbon fiber tubes can be connected to form much longer disassembleable tubes and complex 3D structures. Both 2D and 3D joints are possible. Assembly is very easy. Simply prepare inside of tube by lightly sanding, apply adhesive and insert connector. No complex fixturing, screwing or drilling of tubes neccesary. DragonPlate Pultruded Carbon Fiber Tube Connectors allow for light-duty customizable structures, with varying heights, widths, depths, cell sizes, and lengths to meet your specific design criteria. Trusses assembled from our 0.5" tubing connectors provide a cost effective method of manufacture and an extremely stiff lightweight structure. 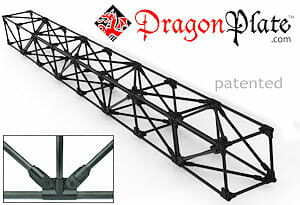 DragonPlate square carbon fiber tube structures utilize our square or rectangular tubing, and flat stock gusset plates. This connection method allows for customizable robust structures, with varying heights, widths, depths, cell sizes, and lengths to meet your specific design criteria. Trusses assembled with our flat stock gusset plates and braided tubing are designed for highly loaded applications. 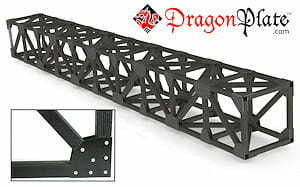 The carbon fiber gusset plate provides a robust joint which transmits the load from one truss member to another. Trusses built from these materials can handle the daily wear and tear when out in the field.